William Stuart not willing to answer questions about raid on Town Hall. He has been the highest elected official in the Town of Bridgewater for nearly three decades. But when the NBC Connecticut Troubleshooters tried to ask William Stuart about a federal investigation being launched into Town finances, he did not answer our questions. In July, more than a dozen FBI agents raided Town Hall and carted away boxes of financial records dating back five years. Town officials said they don’t have any idea what sparked the interest of federal agents. And the first time we approached Stuart with our camera, he drove away from us. At the time of the raid, Stuart told NBC Connecticut over the phone that he didn’t know what the FBI was looking for. But Stuart’s state and federal tax returns are among the documents listed in a search warrant issued by a federal judge and obtained by the NBC Connecticut Troubleshooters. Stuart is the only individual named in the FBI warrant. “Which is suggestive of the possibility that Bill Stuart himself may be under investigation in some manner and that they may be trying to look at his income puzzle,” said Jeffrey Meyer, a Quinnipiac University Law professor. Sabina Kuriakose investigates into what lies below the surface in Bridgewater. Still, Meyer cautions that it’s too soon to tell exactly who or what the FBI may be investigating. The warrant also called for the collection of town invoices, bank statements, computers, ledgers, and journals. "Especially given a town of this size--a small, bucolic area. It's kind of rare for the FBI to be involved,” Meyer said. Many Bridgewater residents are shocked by all the commotion. The town is divided along lines of loyalty to Stuart, and to his opponents. "It would be best for everybody if that would come out,” said longtime resident Linda Klein. “It should be his first responsibility to make sure that the community does fully grasp and understand what it needs to be told,” said Randy Klein. It’s not the first time Stuart has come under scrutiny. Three years ago, the Attorney General’s office launched an investigation into management of the Burnham Fund, a charitable fund intended to help the town’s poor. Until 2008, Stuart alone determined who received the money from the fund and how much. The investigation into past management of the fund is ongoing. 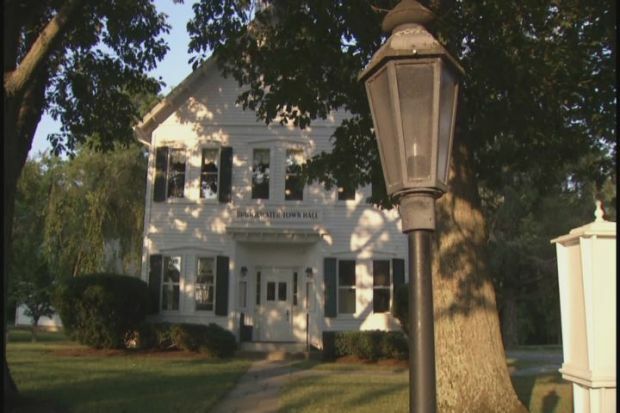 The NBC Connecticut Troubleshooters requested hundreds of pages of documents pertaining to the fund from the town under the state’s Freedom of Information Act. Town officials said the FBI confiscated all 442 pages in their raid. NBC Connecticut has since been working to get copies. NBC Connecticut's Sabina Kuriakose asked Stuart about the accusations being made against him. "What do you want to tell taxpayers to reassure them about the way you handle their money?" Kuriakose asked Stuart. "You tell them. You're the one that's doing all the talking,” Stuart answered. "Mr. Stuart, why are you dodging our questions?" Kuriakose asked. "Could you just leave me alone?" responded Stuart. "We just want some answers,” Kuriakose said. "I'm going to do my job and I'd like you to leave me alone,” said Stuart. "Why are you locking yourself in your office?" asked Kuriakose. "So I don't have to talk to you,” said Stuart after closing his door. Neither the FBI nor the Attorney General’s office would comment on the status of their investigations.